Home Khalida Jarrar Solidarity Campaign: Free Khalida Jarrar! Stand with Khalida. Stand with Justice. Stand with Palestine. UPDATE: 2 July 2017: Khalida Jarrar was again arrested by Israeli occupation forces in a pre-dawn raid on her home. Also targeted was Khitam Saafin, the coordinator of the Union of Palestinian Women’s Committees. Both have been taken to an unknown location. Samidoun Palestinian Prisoner Solidarity Network urges international mobilization and action to demand the immediate release of Khalida Jarrar and Khitam Saafin, prominent Palestinian progressive and feminist leaders and strugglers committed to the freedom and liberation of their people. The arrests of Jarrar and Saafin clearly come as an attempt by the Israeli occupation to attack Palestinian popular movements and suppress them through fear, arrests and intimidation carried out by a massively armed occupation force. We urge all friends of Palestine and the Palestinian people to join us in reactivating the Khalida Jarrar Solidarity Campaign as well as the campaign in solidarity with Khitam Saafin. These arrests represent an attack on the leaders, the political activity and the popular organizing of the Palestinian people. They must be met with intensified solidarity to demand the freedom of Khalida Jarrar, Khitam Saafin and all of the thousands of Palestinian prisoners behind bars in Israeli occupation prisons. 1. Sign the petition! Sign and share this petition, demanding freedom for Khalida Jarrar and Khitam Saafin immediately. 3. Use the Campaign Resources to inform your community, parliamentarians and others about Khalida and Khitam’s case. 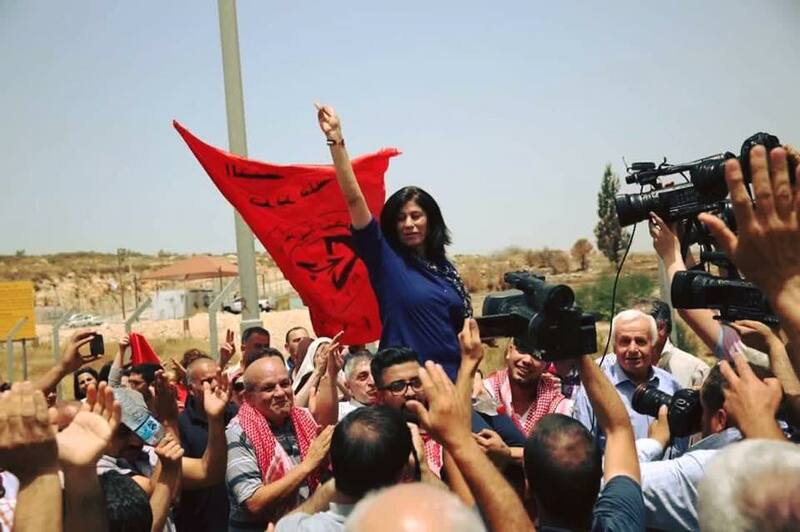 UPDATE: 3 June 2016: Khalida Jarrar was freed from Israeli prison and greeted with a reception at Jubara checkpoint upon her release, where she urged intensified action to free Palestinian prisoners. Salutes to Khalida Jarrar and freedom for all Palestinian prisoners! UPDATE: 25 August: Khalida Jarrar’s military court hearing at Ofer saw the military prosecution present witnesses – two of whom they arrested to force their testimony, one who was brought from prison. The two witnesses that testified denied the information attributed to their confessions, noting that they had been obtained through torture and duress, including threats to their families. The next hearing will take place on 20 September. More details..
UPDATE, 10 August: Khalida Jarrar’s military court hearing at Ofer was once again postponed due to the military prosecution again declining to present witnesses or evidence. The motion made by Khalida’s lawyers at Addameer for her release on bail was also denied despite the clear refusal of the military prosecution to present its case in a timely fashion. Her next hearing is 24 August. UPDATE, 4 August: Khalida Jarrar’s military court hearing at Ofer was postponed again, due to the military prosecution not bringing its witnesses. Addameer has a statement: http://www.addameer.org/news/hearing-plc-member-khalida-jarrar-postponed-10-august-2015. Her next hearing will take place on 10 August. UPDATE, 13 July 2015: Khalida Jarrar’s hearing in Ofer military court was reported on by Addameer. Her lawyers argued for her immunity as a PLC member, about the illegality of the occupation and Khalida’s arrest in Area A, the arbitrary charges against her and that this arrest is retaliation for her defiance of the attempt to displace her forcibly to Jericho in 2014. The next military court hearing is scheduled for 4 August. UPDATE, 12 July 2015: Khalida Jarrar’s next hearing is scheduled to take place tomorrow, 13 July, in Ofer Military Court. Click here to read Khalida’s letter from prison. UPDATE, 29 June 2015: Jarrar had her first family visit with her daughters, Yafa and Suha. All other family members were denied visit permits, either because they were “not first-degree relatives,” or due to undisclosed “security” pretexts, like Khalida’s husband Ghassan. UPDATE, 22 June 2015: Jarrar’s military trial on 12 charges of engaging in protected political advocacy and human rights defense began with a short hearing; the next hearing in her military trial is expected in July, although her case was “continued indefinitely” by the Israeli military court, leaving her detained indefinitely. Link to report by Gideon Levy and Alex Levac on the hearing. The hearing was attended by Jarrar’s daughters, Yafa and Suha, visiting their family from Canada, Ha’aretz reported, calling Jarrar “the most famous Palestinian prisoner in the world today.” Link to Haaretz report on the 12 charges. On May 21, a military court judge ordered Jarrar’s release on bail; however, the military prosecution appealed the release order, and on May 28, the military court ordered Jarrar imprisoned until the end of proceedings. International organizations, including Addameer, Lawyers for Palestinian Human Rights, and the National Lawyers Guild, filed a complaint with the UN Special Rapporteur for Human Rights Defenders about Jarrar, noting that her peaceful work to promote, protect and realise human rights and fundamental freedoms means she is entitled to the human rights protections outlined in the United Nations Declaration on Human Rights Defenders. UPDATE, May 5: As of May 4, Khalida Jarrar’s administrative detention is officially limited; she is now being officially imprisoned on the basis of the 12 entirely political charges against her in Israeli military courts. This came one day before a scheduled hearing on her administrative detention. “Whether Khalida Jarrar is being detained under administrative detention or for Israeli military trial, she is facing one framework of repression, racism and mass incarceration targeting Palestinian political life and expression. Both systems of detention are part and parcel of maintaining military control and occupation over the Palestinian people, and both are arbitrary forms of political detention and imprisonment that target Palestinian leaders and organizers,” said Samidoun Palestinian Prisoner Solidarity Network. More information and Statement from Addameer. UPDATE, April 26: Khalida Jarrar’s April 29 hearing was postponed; a new date will be announced in the coming days. A flashmob protest in Brussels on April 26 called for Khalida’s freedom. Pictures at the link. The Israeli newspaper Ha’aretz ran a staff editorial urging Jarrar’s release, following up on a lengthy April 24 interview with Khalida’s husband, Ghassan Jarrar. A new website, http://freekhalidajarrar.org, has been launched, focusing on Khalida Jarrar’s case, with input from Samidoun and other Palestinian prisoner and solidarity organizations. These measures—including the aggressive persecution of Jarrar, an elected official—are Israel’s message to the Palestinian people not to challenge its power. As Israel attempts to silence and break her down, what makes Khalida Jarrar, our Truthdigger of the Week, so dangerous is her speaking truth to this power. Activists in Brussels planned a flashmob for April 26, focusing on freedom for Khalida Jarrar, to be attended by Joke Callevaert, a Belgian lawyer who observed Khalida’s military court hearing. Jarrar herself met with Palestinian lawyer Hanan al-Khatib, denouncing her arrest as having “no legal justification” and highlighting the harsh conditions for Palestinian prisoners, particularly the use of the metal “bosta” for the 9-hour trip to Ofer military court from HaSharon prison. UPDATE, April 17: The Portuguese Assembly of the Republic (national Parliament) voted on April 17 to adopt a solidarity vote urging the immediate release of Khalida Jarrar, a measure proposed by the Portuguese Communist Party and supported by the Socialist Party, Greens, and the Left Bloc. The vote followed a letter by 58 Members of European Parliament urging Jarrar’s immediate release and EU action to pressure Israel for her freedom. 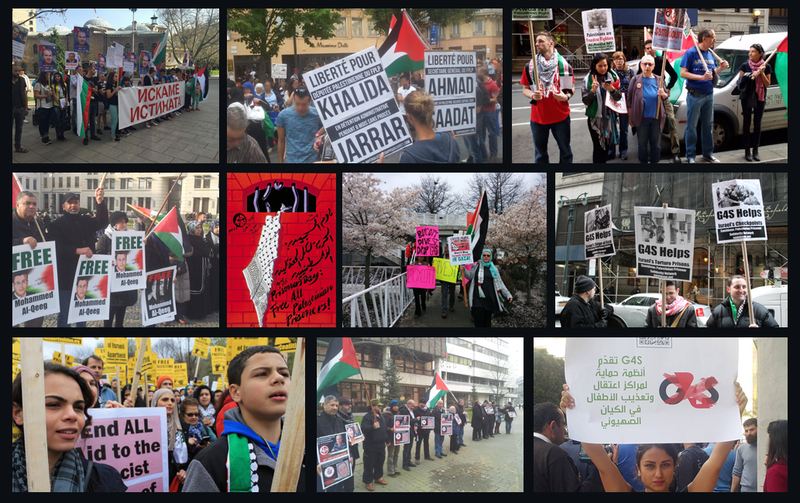 April 17 also marked Palestinian Prisoners’ Day, where Jarrar’s case was highlighted by protesters and activists around the world. UPDATE, April 15: The Israeli military court in Ofer convened a hearing on the case of imprisoned Palestinian parliamentarian, feminist and leftist political leader Khalida Jarrar, whose case has garnered widespread international support since her arrest on April 2. Jarrar had previously rejected an Israeli order to deport her from her home in Ramallah to Jericho, achieving a victory and the cancellation of the order. Jarrar had previously been ordered to six months’ administrative detention; the hearing on April 15 was a rescheduling of the prior hearing on April 8, ostensibly to confirm the military order of administrative detention without charge or trial. Instead, on the April 15 hearing, the administrative detention order was confirmed; in addition, the military court leveled 12 entirely political charges against Jarrar, all of them related to her public speeches and political activities and advocacy for Palestinian political prisoners. It must be noted that nearly all Palestinian political parties and organizations, including the Popular Front for the Liberation of Palestine, are banned by the Israeli military occupation, by military order, and membership in those parties, attending public events, engaging in television interviews or giving public speeches may be prosecuted by the Israeli military occupation. Despite the indictment, the military judge retained the administrative detention order, in order to continue to imprison Jarrar without trial and without providing any reasons to continue her detention and deny her release on bail. Her next hearing, on whether she will be imprisoned until trial on the charges, will be held on April 29, followed by a hearing on administrative detention May 6. UPDATE, April 12: Khalida Jarrar’s hearing at Ofer Military Court was postponed by one day, to April 15 at 11:00 am, reported Addameer. Support for Khalida’s freedom has continued to grow: the UN High Commissioner on Human Rights addressed her case; Amnesty International issued an urgent appeal about her detention; Human Rights Watch published a bulletin on her case; CODEPINK sent an action alert, while in France and Brazil, more political parties and organizations expressed their support for her freedom. UPDATE, April 8: Khalida Jarrar’s administrative detention confirmation hearing at Ofer Military Court was postponed for six days, until April 14, reported Addameer. There were 14 items of “open evidence” (aside from the secret evidence not presented to Jarrar or her lawyers) not provided to her defense lawyers; they requested and received the postponement until April 14. UPDATE, April 5, 2:30 pm: Khalida Jarrar, Palestinian leader, parliamentarian and feminist, has been issued a six-month administrative detention order imprisoning her without charge or trial, at the behest of the Israeli military commander in the West Bank, reported Addameer Prisoner Support and Human Rights Association – Jarrar’s lawyers – on April 5. UPDATE, April 5: Khalida Jarrar‘s first court hearing was rescheduled until tomorrow. Addameer Prisoner Support and Human Rights Association lawyer is on his way to Hasharon prison now to try to visit her. News via Yafa Jarrar. UPDATE, April 4: Khalida Jarrar refused to speak or eat at all while she was held at Ofer under interrogation before being transferred to HaSharon prison, reported her daughter Yafa. Denmark – Internationalt Forum: Freedom for Khalida Jarrar! UPDATE, April 2: Khalida Jarrar has been held in Ofer under investigation. Her investigation period has ended and she will be transferred to HaSharon prison. Her detention may be extended on Sunday. A military prosecutor will either submit charges, hold her under administrative detention, or release her. Khalida is in the Palestinian National Commission for the followup of the International Criminal Court. BREAKING NEWS: April 2, 2015 – Khalida Jarrar’s Ramallah home was raided by dozens of armed Israeli occupation forces. Khalida’s husband was locked in another room as the Palestinian parliamentarian and leader was forcibly taken from her home and arrested by Israeli forces. Take action now to demand her immediate release. LATEST UPDATE: As of September 16, 2014, Khalida Jarrar has achieved victory! Occupation military court lowered the expulsion order from six months to one month; with one month having passed since the date of the order, the expulsion order has been lifted. Congratulations to Khalida Jarrar and thank you to the thousands around the world who made a critical difference! Victory for Khalida Jarrar – on the road to victory for Palestine! Khalida Jarrar, member of the Palestinian Legislative Council, leader in the Popular Front for the Liberation of Palestine, and longtime advocate for Palestinian political prisoners, was given an internal expulsion order by Israeli occupation soldiers who invaded her Ramallah home at 1:30 am on August 20, 2014 ordering her expelled from Ramallah to Jericho within 24 hours. Click here to take action and stand with Khalida! Approximately 50 soldiers surrounded Jarrar’s home, delivering the “Special Supervision Order” that ordered her to Jericho within 24 hours, and to stay within the city limits of that city for an initial period of six months. The Order (unofficial translation here) comes from an Israeli military court, is based on secret evidence and offers nothing more than allusions to “intelligence information” to justify this forced expulsion and transfer. Jarrar refused to sign the expulsion order, saying “you, the occupation, are killing our Palestinian people. You practice mass arests, demolish homes, kidnap people from their homes and deport them. It is you who must leave our home.” She has moved to stay in a “protest tent” outside the legislative council building in Ramallah.